At Lutheran Haven Rehab we understand the challenges of an injury or debility. We offer inpatient, home health, and outpatient services that can bring your physical abilities back to your full potential. 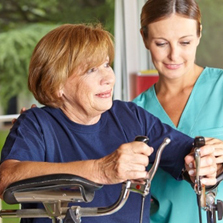 Our Rehab Teams consist of Physical Therapy, Occupational Therapy, and Speech Therapy. They provide skilled and compassionate care as well as an innovative treatment plan designed specifically to help each individual regain health, balance, and wellness. The treatments are designed to improve (1) strength, (2) balance and mobility, and (3) range of motion and flexibility, while promoting safety and fall prevention. We strive to give you the same therapist each visit after your initial evaluation to build your program and develop the best holistic approach to your healing. Our highly trained and experienced therapists will work closely with your primary care physician to assure the best continuity of care and that we are addressing your specific needs. Let us guide your way to Flexibility, Mobility, and Recovery, so you can get back to living! Give us a call at (407) 365-5676 to be directed to our Rehab Department to set up your appointment and to begin your road to recovery and better living!